When writing a blog, it can be one of the hardest things to come up with content ideas. Oftentimes it seems like everything has already been said. What more can you contribute to the discussion? What else is there that your audience would find interesting? Feeling stuck in writer’s block is not a lot of fun. For that reason, in this post we want to show you how you can get out of it. In the following, we will go over some tried-and-true strategies to consistently come up with new content ideas. This will prevent you from ever again having to look at a blinking cursor with no clue what to write. There are many ways to come up with content ideas. Some of them will work for you, some of them won’t. Just go through the list below and find what fits your workflow and take it from there. When you sit down to write, coming up with a topic shouldn’t be the first thing you do. Instead, at that point, your topic should already be clear and you should be ready to flesh it out. A good way to make that happen is to create many topics at once. If you are already in the process of researching topic ideas, it’s easier to just keep going. After all, batching similar activities is an effective productivity tip. So, just continue for a few hours until you have enough topics for a couple of weeks. That way, you always have a list of potential articles at hand and can just start hammering one out. 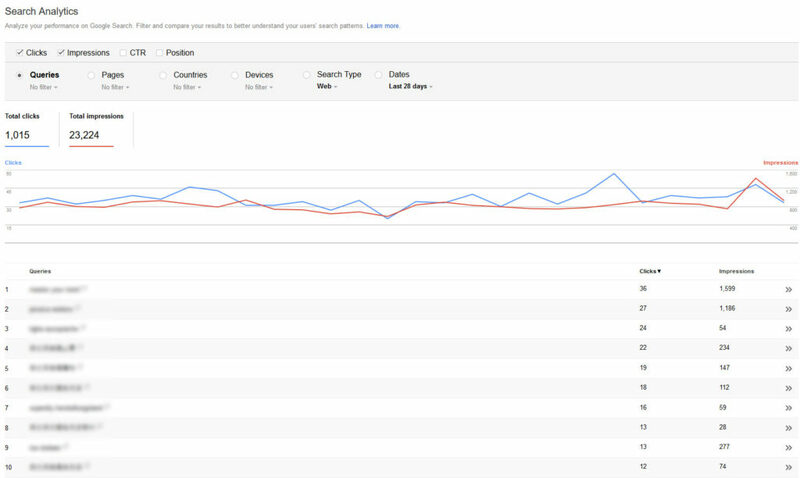 Tools like Google Analytics and Search Console should always be part of your SEO efforts. They can tell you a lot about how your audience finds your site, what they like about it and how they interact with it. For example, looking at the most frequented pages will give you a good idea about their content priorities. However, one of the most important parts is the Search Analytics section in Google Search Console. It is located under Search Traffic and tells you which search queries you are already ranking for, even if just tangibly. This is very useful intel and from here you should be able to come up with more than a handful of ideas for new blog posts. It also makes sense to check back regularly as the search terms will change the more content you publish on your site. Audit your audience — For additional content ideas, see what your audience is interested in. You can do so by checking what they publish and which other people they follow and interact with. Alternatively, talk to them directly. Ask what they are currently struggling with, what they are into at the moment or some concrete questions about different topics. Take part in Facebook Groups — By joining groups in your topical area (or even founding your own), you can find a lot of potential topic ideas. Follow the discussions to see what people are struggling with, which questions they have etc. That way, you can find a lot of problems to solve for your audience, which is always a great basis for a blog post. Check Twitter — Tweets offer lots of information about what people in your niche are thinking about. Plus, the platform is easily searchable. Even better, you can subscribe to important hashtags and search terms via Tweetdeck. That way, you have a live feed of people’s thoughts and can even filter them by engagement and other factors. Hang out on Quora — This is literally a platform based on people asking questions. Just search for any keyword or topic idea and you will find plenty of things your audience seeks help with. This will give you lots of input for what to cover on your site. Of course, there are many more platforms out there that you can mine for content ideas such as Reddit, LinkedIn, and Pinterest. For more ideas, check this article. Blog comments are one of the best sources of new content ideas. Oftentimes, people will tell you directly what they would like to hear more about – a gold mine for new blog posts. So, not only should you answer every comment but also take note of what commenters are saying. Sometimes you can use their questions directly as blog post titles. Remember, people type the same stuff into Google, so these are basically key phrases you can base entire articles on. However, don’t just concentrate on your own comment section. Frequent other blogs in your industry and see what readers say underneath their content. This will often point you to what is missing from your competitor’s articles. If you can fill in that gap, all the better for you and your authority. Talking about other websites in your sphere, those also a good source of inspiration. Checking what other people are writing about will give you heaps of content topic ideas and point out areas which you have neglected so far. Better yet, input their blog address into BuzzSumo. This will show you which of their blog content is performing the best. That way, you can find proven content ideas. Knowledge like that is especially useful when combined with the Skyscraper Technique. The way it works is that you take well-performing content and make it even better. This can be by adding more information, making your post longer and more detailed, offering better design or any other way to create additional value. 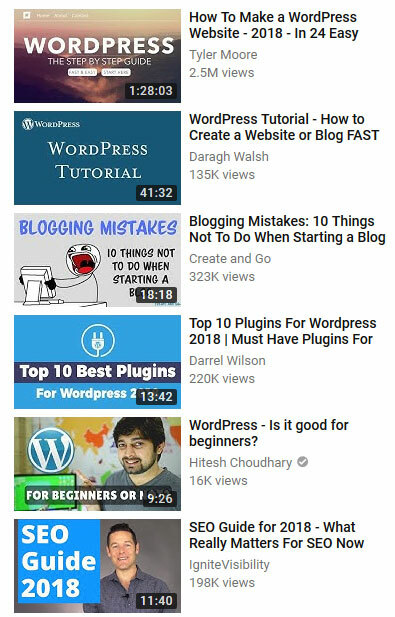 Doing so not only gives you some great content ideas, but it’s also an excellent way to get to the front page of Google. Search suggestions are really helpful to go from general topic to concrete ideas. We already mentioned it in the article on keyword research. When you input anything into the Google search bar, it will automatically complete suggested related search phrases to you. 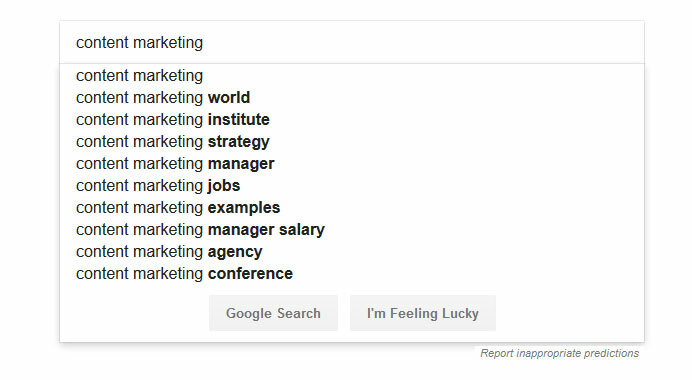 This already gives you concrete ideas about what users type into Google since these suggestions are based on actual searches. You can combine that with related searches at the bottom of the SERPs. These are another valuable source of concrete key phrases as well as blog post titles. Plus, you already know that they are relevant to your audience, so ka-ching! If you can’t come up with anything yourself, you may also get support from technology. There are a number of tools out there designed to help you generate content ideas. HubSpot Blog Ideas Generator — Enter up to five different keywords and the tool will spit out blog post titles for a whole week. However, by now the suggestions are quite limited and repetitive. For more, you need to sign up for their premium solution. Portent Content Idea Generator — Similar to the above. Enter a topic and the tool will put together a blog post title for you. Refresh to get additional ideas. Answer the Public — When you submit a keyword to this service, it will pull lots of data from Google about what people look for in connection with it. Especially useful are the questions that users type into the search box. However, the site also cycles through every letter of the alphabet in combination with your keyword to see what else people look for. Ubersuggest — Similar to AtP. Just input a topic/keyword and the tool will not only give you information about its number of searches and difficulty ranking for it, but you also get a long list of keyword ideas related to your input. From here, it’s much easier to come up with blog post topics. 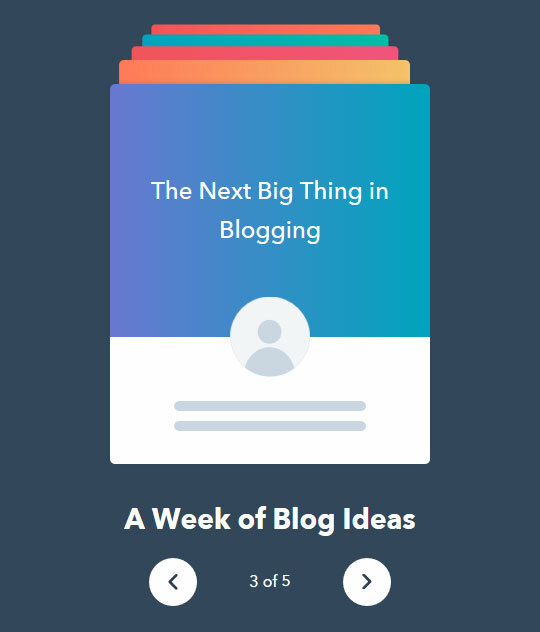 For additional tools to come up with blog post ideas, check this post. Storytelling is one of the most effective ways to connect with your audience. There is nothing that we as humans can relate to as well as what happens to other people. Vulnerability is a great connector. So, if your content idea well has run dry, think about your life experience. Are there any interesting stories that happened to you that others could learn from? Lessons that are worth sharing? Big wins you have experienced? This will not only help you come up with new content ideas, but it’s a powerful way to tell your audience more about yourself. Plus, any story will be unique to you, so nobody else will have that content. YouTube is the second-largest search engine in the world. By now you can find information on literally anything on the platform. 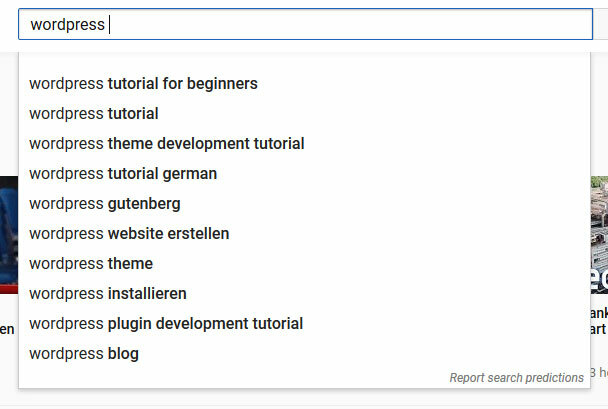 How is that helpful for you to find new content ideas? Because you can use it the same as Google and take advantage of its related search functions. For one, when you start typing in a search phrase, here, too, you will get suggestions that can already function as concrete topic ideas. In addition to that, related videos pop up whenever you are watching something. These can give you ideas for additional content. Plus, don’t forget to read through the comments. I know, I know, YouTube comments are literally the worst but there are also legitimate inquiries from users that help you understand what else they are interested in. Ideally, you should stay on top of these in order to keep informed. However, they can also be a great source of content material. You can tell your audience what these developments mean for them or how to best deal with recent changes. This gives you both something to share and makes you look like an authority if you do. A win-win situation. Older content can also serve as a springboard to come up with new content ideas. This is especially true if a lot of time has passed and the information is no longer accurate. I did that here on Torque. My first article ever was 4 Ways to Turn WordPress into a Multilingual Website. Then, when many things had changed after a few years, I wrote a similar article called 11 Best WordPress Translation Plugins For Multilingual Websites. I’m sure you can do similar things with your old posts. However, instead of an update, you can also write supplemental content. For example, I could have used the old post to write about how to translate content most effectively so you can include it on your site with one of the translation plugins. So, keep that in mind when generating content ideas. Writer’s block can happen to anyone. Not every day is an inspired day for writing. However, one of the best antidotes is to have a list of topic ideas already at hand. That way, you are ready to go at a moment’s notice. To achieve that, above your have learned effective strategies to come up with fresh content ideas. These should be enough to keep your blog well populated. The key is to just put together a large list using good old-fashioned keyword research and market research. Then there are no excuses left. What is your favorite way to come up with new content ideas? Let us know in the comments section below!